The atmospheres are completely different, but in many ways weekly racing can almost be like a trip to the casino. All the hard work, time and effort spent in the shop through the week can come down to a roll of the dice once you head onto the race track. To put things in simple, easy to understand terms, stuff happens. After putting in some long hours in the shop – that also included a couple of trips to Chub Frank’s facility in Pennsylvania – Craig Graham was able to get the #98 Pro Late Model back on the track and rejoin his son Brandt – who recently scored his first dirt racing top 10 finish – at Brighton Speedway’s Fan Appreciation Night Saturday, June 9th. Craig finished 11th in the main event, while Brandt was 8th; another career best effort. Follow the team behind the scenes and at the track by checking @Graham_Racing on Twitter and the Graham Racing team page at www.facebook.com. 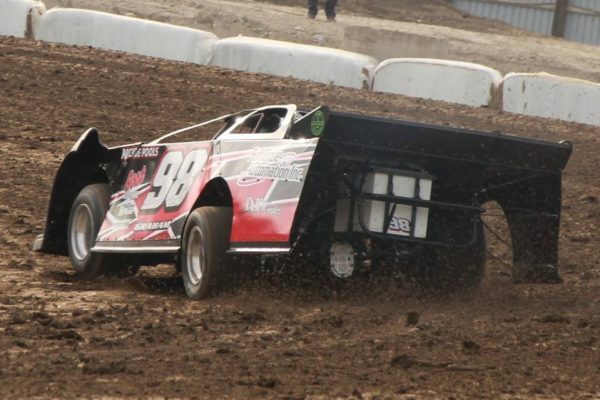 Look for www.graham98racing.com, an Image Factor web-site. Clarke Motorsports Communications is proud to support the 2018 season for Graham Racing. After being forced to the sidelines following an early season rollover, Craig Graham logged an 11th place finish in the Pro Late Model feature – Saturday, June 9th – at Brighton Speedway.